We’ve been keeping track of all the animals we’ve seen in our yard, but now that it’s winter, seeing something new is rare. 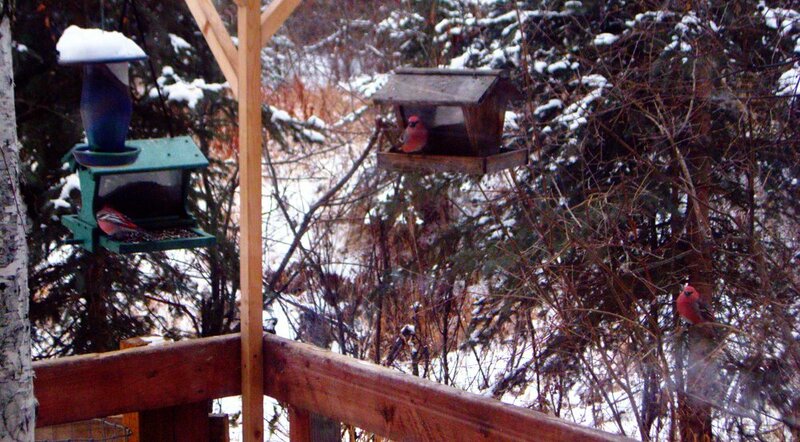 Last month we saw our first great horned owl of the fall season, and today the pine grosbeaks showed up. The males are a bright magenta color (like the three in the photo on the right) and the females are a light olive green color. Not only are they very colorful birds, they have a really delicate song that’s not at all what I expect to hear. I took the picture through the sliding glass door to the deck, so there’s some glare on the window. Click on the photo for a larger version where you can really see them.